We came across an engraving posted on social media by Dr Hannah Greig recently and for those of you who know of our propensity for disliking unsolved mysteries we were immediately intrigued and wanted to see if there was any more information about the woman depicted. The engraving was produced by Robert Thew, historical engraver to His Majesty Prince of Wales and the British Museum had dated the engraving as being sometime between 1778 and 1802. We double checked the parish records to make sure when Robert Thew died and found his burial on 10th July 1802 so we knew that this engraving must have been produced out prior to this date. The Manchester Mercury, June 10th, 1794. To all who are admirers of the extraordinary productions of nature. Just arrived and may be seen, by many number of persons, in a commodious caravan, in a field, adjoining the race ground on Kersal Moor, from eleven o’clock in the morning till nine in the evening. Born without arms, and will work with her toes, in a complete manner as with hands and arms, she cuts watch papers, opens watches and put the papers in. This curious artist threads her needle well and does wonder of the age excel! And each, amaz’d go satify’d away. Checking through the newspapers, sure enough, we found her burial in the Lancaster Gazette, April 21st, 1804, so assuming her age was roughly correct then she was born around 1760. From her burial, we know her name was Mary and that she was the wife of John Morrall. The trail goes cold at this point as there as quite a few possible marriages which could be for them. Suddenly, at Bury, Mrs Morrall, aged 44; a woman well-known throughout the kingdom, as an extraordinary production of nature, having been born without arms. She could cut the small watch papers and devices, in the most ingenious manner, with a pair of scissors, by means of her toes. She appeared in a public exhibition, in good health, so recently as at last Salford fair. We did however come across some other people who were in a similar situation to Mary Morrell who used their feet in a like manner including the wealthy Mary Evans and a Miss Hawtin of Warwickshire. True Briton, Tuesday, June 25, 1799. A marriage took place on Tuesday celebrated at Wells, which excited a considerable degree of curiosity and entertainment. The bride, Mary Evans, was born without arms but enjoyed the use of her feet in such a manner as to be able by her toes to cut out watch-papers and work at her needle with singular facility. For many years past she has attended the principal provincial fairs as a show, and thereby acquired a fortune of nearly £800. She is now between 30 and 40 years of age, of very diminutive stature, and with a countenance certainly not overcharged with feminine loveliness; added to these, her eyes are weak. But love, imperious love, who knows no discrimination of rank or person, impressed this spinster with passions ardent and animated. The driver of her caravan, a young man named Simpson, was the object of her choice; time had made him familiar to her deformity, and to her riches. On Tuesday last they were married amidst an immense concourse of spectators. During the ceremony some difficulty arose as to the disposing of the ring, the bride not having a finger on which to place it, but as the earnest solicitations of the parties, this form was dispensed with. Norfolk Chronicle 30th October 1784. Miss Hawtin, the celebrated Warwickshire young lady, born without arms, and will mark with her toes as a compleat manner s with arms and hands, she also cuts curious watch papers etc. Sarah Biffin was born at East Quontoxhead, in Somersetshire, on the 25th October 1786. Her father was a draper and she was reared with much care and tenderness under the immediate eye of an affectionate mother, and in the society of four brothers and sisters, until her nineteenth year, when from the improvement she made in drawing, unaided by instruction, and the circumstance of her being enabled to work at her needle, write and, and in fact, execute with more than ordinary facility (notwithstanding the want of arms), the duties that devolve on females of the middling class it was determined to accede to her wishes, by placing her with an artist named Dukes. This individual soon adopted a very profitable course, and Miss Biffin exhibited in every part of the United Kingdom. 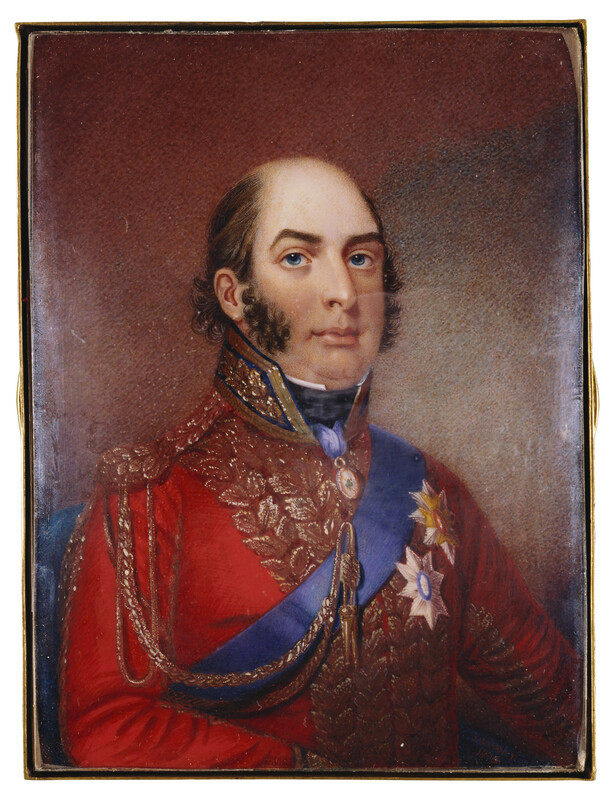 Of the perfection to which Miss B. has arrived as an artist, the best proof that can be adduced is, that the Duke of Sussex presented her with the largest medal at the Society of Arts in 1821. Early in life, she was honoured by the particular attention of Lord Morton, and to that nobleman, who was himself an excellent artist, Miss B, is much indebted for the wonderful progress she made in the art. His Royal Highness the Prince of Orange was amongst the number of her patrons, and, during a visit to Brussels, he sat for his miniature, with which he was much satisfied, that his Royal Highness presented Miss B, with a sum of money far exceeding her demand. On the 6th September 1824, Miss B was married, by the Rev. Mr Hole, at Killton, Somerset, to a Mr William Stephen Wright, a gentleman who had been long attached to her. At the ceremony of marrying a lady without arms may be looked upon by some as a matter of difficulty, the following mode was adopted. Mr. Wright was desired to the ring against the should of the lady, and afterwards, having put it on a gold chain which she wore around her neck, it was placed in the bosom. 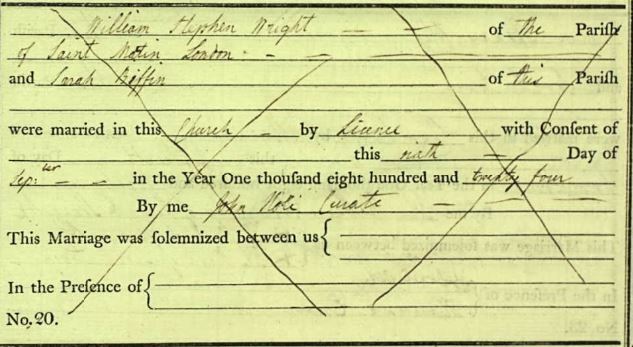 Curiously, their entry in the marriage register has been crossed through with no explanation provided. All the details match those of the newspaper report except for the date itself which wasn’t quite correct. It was reported some years later though, that although married they never actually lived together and went their separate ways. There were rumours, which Sarah strenuously denied, that her husband had made off with her money. Whilst the people we have looked at were regarded as ‘human oddities or freaks’ at the time, with the public at large often paying money to see them at the likes of Bartholomew’s Fair, it’s interesting to note that their absence of limb(s) is not the main focus of the reports it’s almost an aside. The focus is on what they could do and about the skills they developed to live a full life. Very interesting post and you made an important point….what they COULD do, as opposed to what they couldn’t do. Very interesting! Can you tell me more about watch papers? I’ve never heard of them. Yes, I wanted to ask about that, and forgot! I grew up at the back end of the thalidomide crisis and I have to say the emphasis on being able to do as much as possible is a much greater boost to the dignity of the women featured here than the write-them-off attitude towards the thalidomide disabled. These women are admirable in their abilities and determination. Freak shows can be horrible things, but good on Mrs Morell and Miss Hawtin for exploiting them. this site is the works on watch papers! Yes, have just been looking at that. From your message with the photo I also note that it could be used as a guarantee of workmanship too. I suspect that one might have been slightly post Georgian era as I haven’t seen similar ones to that. I think I talked Sarah into doing a blog post on watch papers too…. You did & I have 🙂 Will run it in a few weeks as we’re already sorted for this month.